See below for my list of 14th Birthday Party Ideas. The older teenagers get, the more they want to act like grown-ups. So don't be surprised if they seem hard to please at this age. It's perfectly normal for there to be a bit of a difference between what you think is suitable for 14th birthday parties, and what they actually want to do. The trick is to let them choose what might be a more adult party theme, but then tone it down so that you execute it in a way that's appropriate for their age. Alternatively, let them feel like they are doing something a bit more independent. A friend of mine booked a suite in a kid-friendly hotel for her twin daughter's 14th birthdays. This meant they could use some of the hotel's facilities and hang out around the pool and swim during the day (with a chaperone) while their mum decorated the room for a Girls Night In. She filled the room with lots of food, cakes, and decorations and some girly things like face-packs, make-up, and fluffy dressing gowns, then just let them hang out with a group of friends and watch DVD's, have MTV on, and play games. Their older sister acted as chaperone and stayed over in one of the adjoining rooms to make sure they didn't get too noisy, then everyone had breakfast together the next morning before checking out. The fact that they could have a sleep-over in a hotel away from home made them feel much more grown up and seemed to go down a storm. Most of the 14th birthday party ideas below could easily be combined with a hotel room setting or other venue to make them feel like they've got a bit more freedom. If there's nothing you fancy from the list below, be sure to check out the Party Themes A-Z incase one of the themes from another category catches your eye. Most party themes can be adapted to suit different ages with just a little tweaking. If you have some good 14th Birthday Party Ideas (or you've tried one of my ideas from the list above) share details with other party-ideas-by-a-pro.com visitors. 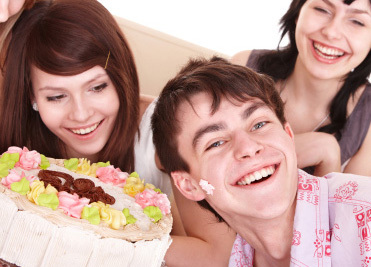 Use the form below to submit your 14th birthday party ideas.